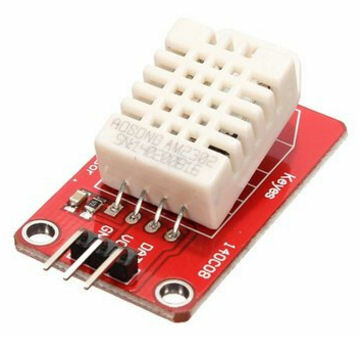 AM2302 Humicap digital temperature and humidity module is a digital output signal containing a calibrated temperature and humidity combined sensor. It uses a dedicated digital modules capture technology and the temperature and humidity sensor technology to ensure that products with high reliability and excellent long-term stability. Sensor includes a capacitive humidity sensing element and a high-precision temperature measurement devices, and with a high-performance 8-bit microcontroller connected. Therefore, the product has excellent quality, fast response, anti-interference ability, high cost and other advantages. Ultra-small size, low power consumption, signal transmission distance up to 20 meters. Making it the best choice for all kinds of applications and even the most demanding applications. HVAC (Heating Ventilation Air Conditioning), dehumidifiers, testing and inspection equipment, consumer goods, automotive, automation, data loggers, home appliances, humidity regulator, medical,weather stations, and other related humidity detection control.